Sonos launches limited edition Blue Note Play:1 speaker | What Hi-Fi? Sonos's first-ever limited edition product marks the 75th anniversary of the legendary jazz label, Blue Note Records, and is the culmination of a series of collaborations between the two companies. 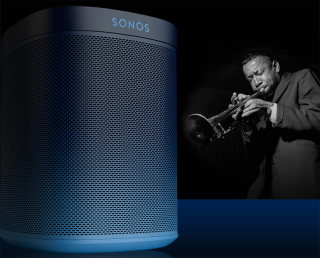 The "Sonos x Blue Note Play:1" speaker has a "vertical fade finish from dark navy to cerulean blue", fitting for the record label that takes its name from the "blue notes" that typify blues and jazz music. The limited edition Play:1 will cost £220 via the Sonos website - as opposed to £169 for a standard Play:1 - and the release date is set to be confirmed over the coming weeks. And if you happen to be in Los Angeles, you'll be able to see the famous Capitol Records Tower turned a kind of blue (yes, we know that wasn't a Blue Note album) this evening [4th February] as part of a "Sonos x Blue Note" event. As part of the collaboration, last year Sonos launched a special Blue Note Records channel full of playlists selected by Blue Note artist and record producer, Don Was. This is available to all Sonos users within the Radio section of the Sonos app. The channel features two dedicated Blue Note stations: Blue Note 101, which features the greatest hits from the Blue Note back catalogue, which spans 1939 to 2014, and Born in Blue, which focuses on Blue Note tracks that have been sampled in hip-hop, featuring tunes from A Tribe Called Quest, De La Soul, J Dilla and the Beastie Boys. This is the second Sonos announcement of 2015, following the recent launch of the new version of the Sonos app - available in beta now for Android users and coming soon to iOS - which aims to make the Sonos app experience simpler to navigate.